It's A Family Adventure! : Winter Wonderland at St Luke's "Bombed-Out" Church, Liverpool 1st to 23rd December 2018 - Competition! 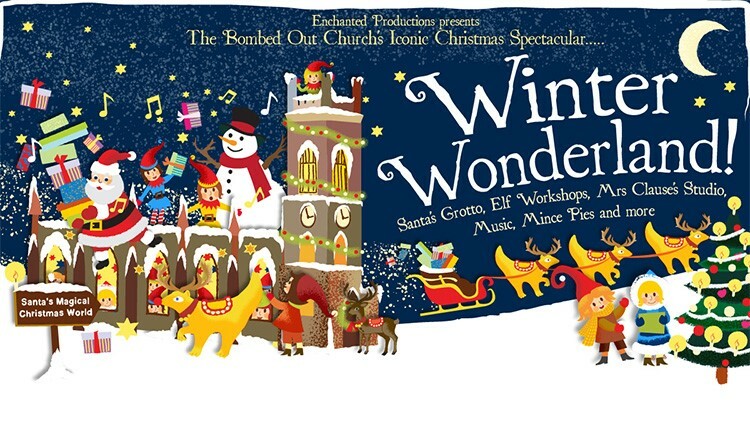 Winter Wonderland at St Luke's "Bombed-Out" Church, Liverpool 1st to 23rd December 2018 - Competition! One of Liverpool's most iconic landmarks will be transformed into a magical, immersive, Christmas attraction for 2018. 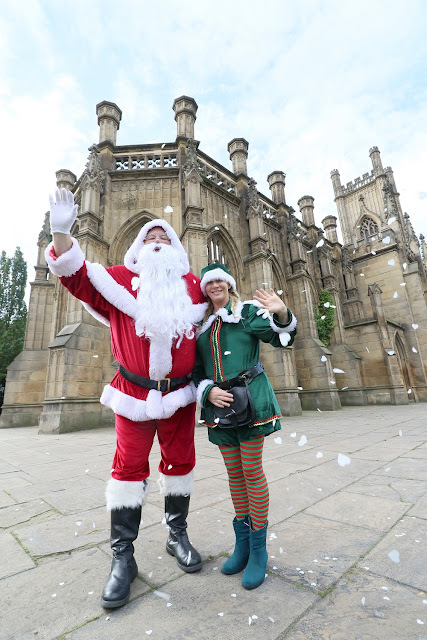 St Luke's "Bombed-Out" Church, situated at the top of Bold Street, will be turned into a Winter Wonderland for almost four weeks this festive season and is set to become the 'must-visit' Christmas Grotto experience of the year in Liverpool. Set against beautiful and atmospheric festive backdrops and with lots to explore, families will be escorted by an elf and immersed into their very own Christmas spectacular full of festive characters, workshops and fun activities. Winter Wonderland at St Luke's "Bombed-Out" Church will take place between Saturday 1st December and Sunday 23rd December 2018, with sessions available to pre-book now. Fondly known as the 'Bombed-Out' Church, St Luke's is one of Liverpool's best loved heritage sites. The festive attraction will transform St Luke's and its grounds in a way which has never been seen before. The interior of St Luke's will be transformed into a Winter Wonderland, where families can make their way through a whole host of activities which includes a special appointment with Santa during the experience. Two-hour timeslots are available to book in advance and the Winter Wonderland ticket price includes Santa's Workshop where youngsters can make their own bauble or Christmas Card to take home; art sessions at Mrs Claus's Art Studio; build and dress up a snowbuddy in hats and scarves in the Snowland; storytelling in Storyland with characters; show off fun dance moves in the Silent Disco; and not forgetting a trip into Santa's Grotto with a gift and framed photograph with Santa to take home. Adults are also treated to a hot drink and mince pie. Ms Christmas from Enchanted Productions said: "We are so excited to be bringing to Liverpool a brand-new, top-quality immersive Grotto experience that hasn't been seen before, and in such an iconic and historic location! It is going to be a really magical and unique attraction for the festive season, for the whole family to enjoy." Early Bird Ticket Offer - Quote SANTA1 when booking for a 20% discount for the first two weeks on-sale. This will be valid for sessions booked for the first two weeks of December only (excluding weekends). Booking - Bookings can be made online at www.ticketquarter.co.uk, by telephone on 0844 8000 410 or in person at the Liverpool Echo Arena Box Office - Kings Dock. We also have a fantastic competition for our readers, offering you the chance to win a family ticket to Winter Wonderland at St Luke's "Bombed-Out" Church in Liverpool for either the 3rd, 4th or 5th of December 2018. Please read through the terms and conditions and then enter using the gleam app below. Good Luck! There is 1 (one) prize of a family ticket (2 adults, 2 children) to attend the St Luke's "Bombed-Out" Church Winter Wonderland Grotto, for either the 3rd, 4th or 5th December 2018. Prize can be used on 1 (one) of these dates only and tickets are not transferable to an alternative date. Competition closes on the 31st October 2018. Winner will be drawn and notified within 3 working days of the closing date. The winner shall have 7 (seven) days to respond to the winning notification and confirm their acceptance of the prize. Should the winner fail to respond, then an alternative winner shall be drawn from the remaining eligible entrants. Winner's details shall be shared with the promoter for the purpose of prize fulfilment and permission shall be obtained from the winner prior to doing so. If circumstances arise that prevent the event from going ahead as planned, then It's A Family Adventure accepts no liability and no alternative prize will be offered. Entries shall be validated to confirm that the entry action has been completed as stated. Incorrect or invalid entries shall be removed. We always go for a walk after the main meal to burn off some calories but mainly to stay awake after so much food! Christmas eve we get into new pjs, leave food for santa and the reindeer and read The Nightmare Before Christmas and the Night Before Christmas while the advent candle burns down. The After Eight Challenge after our Christmas lunch! Getting an after eight from your for head in to your mouth juts by moving your face -no hands! !